Well it's all over for another year! 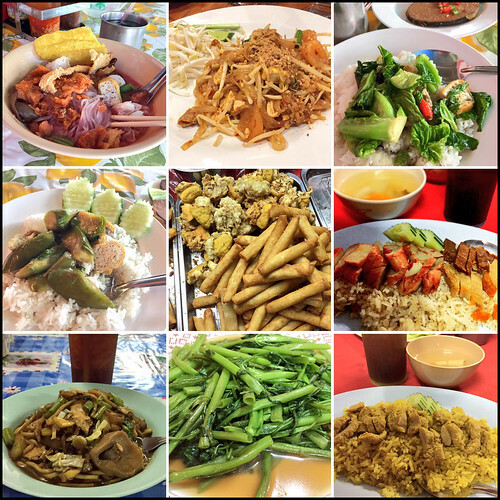 The 2016 vegetarian festival was on from the night of 30th September until the night of October 9th. I did go and get my dose of festival atmosphere and I did stick to the vegan diet with no alcohol for 9 days. For the first few days we thought things were very quiet. We were in Phuket Town several times and there were very few people around compared to previous years. The weather was maybe putting people off, as we have had plenty of rain and not much sun recently. 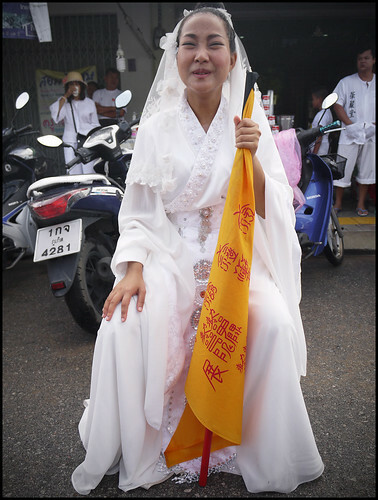 Seemed like it was raining every night in early October, so I was not too keen on attending early morning processions. I must say, rather like last year, that I'm not getting quite the same buzz from the festival as I used to. Maybe I have seen too much of it. 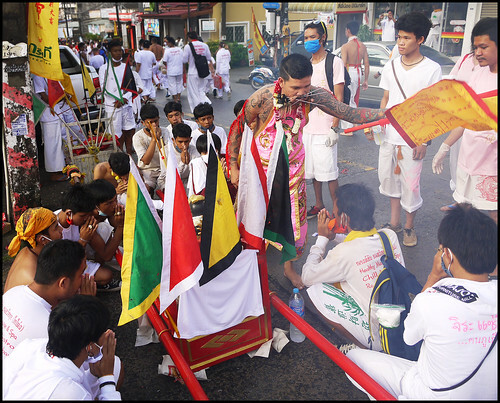 Combined with the the weather, this lack of enthusiasm meant that I skipped all the main street processions in the first week of the festival including the big ones from Bang Neow and Jui Tui shrines. Also our dive shop suddenly got busy and I had lots of work to do. I am still fascinated by the vegetarian festival, and if I could somehow blog full time, I am sure that I would be taking photos every day! The only street procession I saw in the first week was an evening event in Kathu village near our house. The official schedule lists this as "Birth-Death Gods Propitiation". 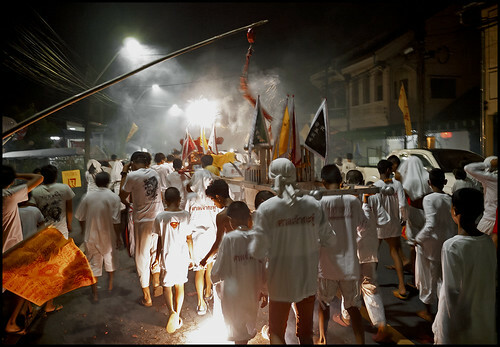 Statues of the gods are carried through the streets of the village accompanied by plenty of firecrackers thrown by the local people or hung over the street on long bamboo poles. Again, this procession seemed quieter than previous years, or maybe I am just getting used to being in the middle of hundreds of exploding firecrackers! On Friday it was the Jui Tui Shrine procession, which is normally the biggest. I did set my alarm for 5:45am, but after waking up decided to reset the alarm for 8am. Extreme laziness. But on Saturday 8th October, I was up and awake even earlier for the Kathu Shrine procession. The shrine is only a few minutes drive from our house, so .. no excuses! To see all that goes on, it's best to arrive at Kathu shrine before 6am. (above) The video shows Ma Song ("entranced horses") before they head outside the shrine for face piercing. I have always wondered .. are they acting? But acting to who? There's no crowd of tourists here. They are not being paid. And they have been doing this for many years, since way before Phuket was a well known place. 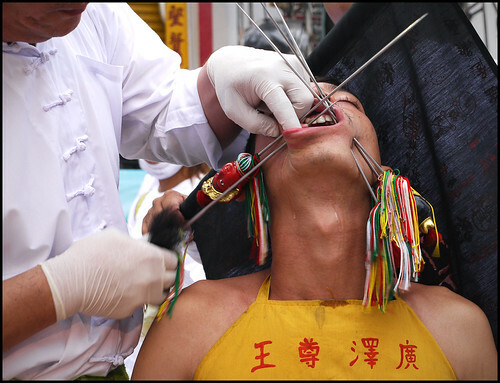 Outside the shrine, face piercing takes place and Ma Song sit getting pierced or waiting for the procession to begin. This all happens before about 6:30am. (above) Getting pierced at Kathu Shrine, 8th October 2016. And then the procession heads off. The pierced Ma Song along with other Ma Song who are not pierced but take on the persona of old men or young girls (there are male and female Ma Song) head off first in no particular order. 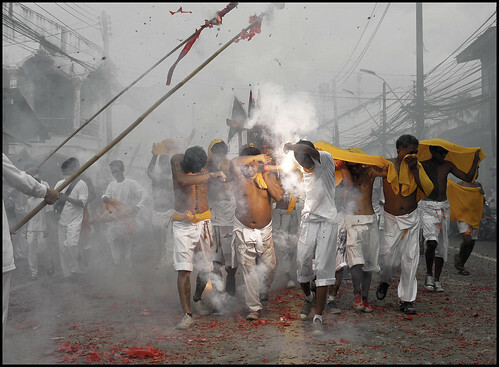 They are followed by teams of young men carrying statues of the gods along with lots of firecrackers again. And by 7am the procession has left Kathu village and everyone walks into Phuket Town - quite a hike, about 10km AND they walk back too! 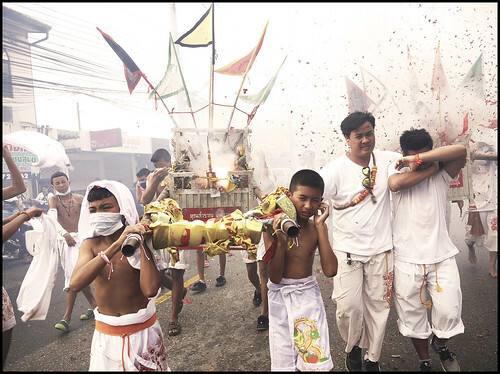 The return to Kathu happens at about 11am accompanied by yet another explosion of firecrackers. However, to make up for this I was up early again the next day. 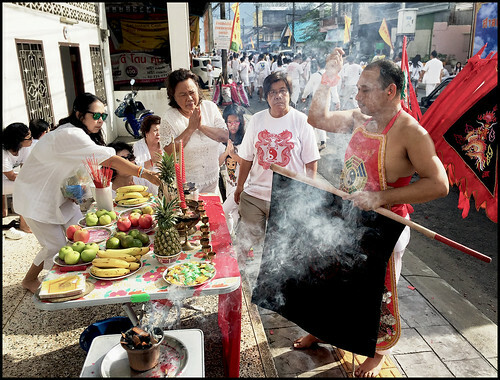 The last procession in Phuket Town, on the last day of the festival, starts from Sui Boon Tong shrine which is close to the big Jui Tui shrine. I had never seen this particular procession before and it was on this morning that I started to enjoy the festival again. I was on the street outside the shrine not long after 7am and had time to buy some breakfast and an iced tea. This one does not start too early! 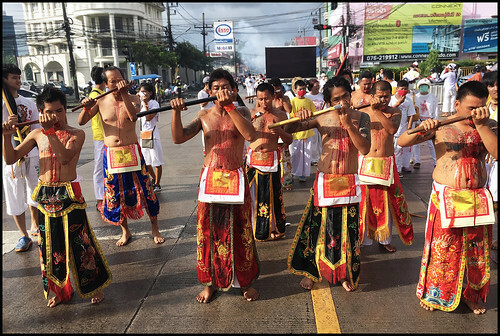 The various Ma Song were in the street, mostly sitting down, and the young guys with their god-chariots were waiting to follow at the rear of the procession. 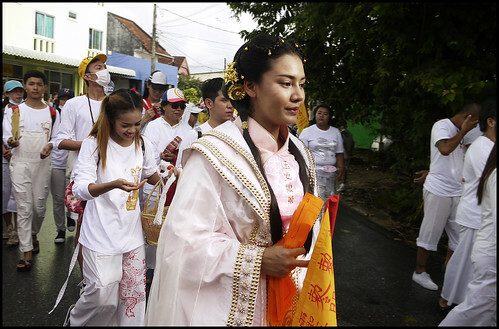 (above) The Sui Boon Tong shrine has many female Ma Song, most of whom are free of face piercings. Starting at the shrine I was able to walk along with the procession. I don't like to simply stand by the side of the road - hard to get photos from that position. I wanted to get some photos showing the Ma Song blessing people along the route of the procession. 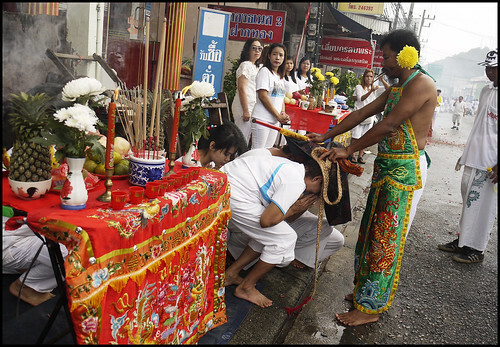 People set up shrines outside their houses or businesses. 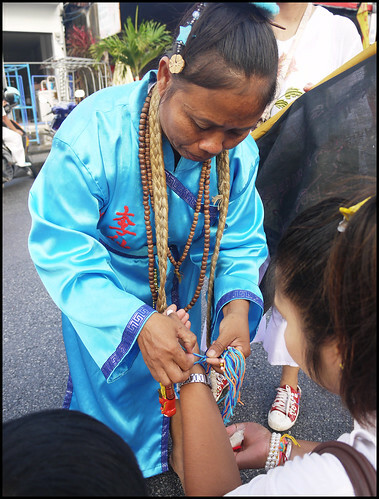 And many of the female Ma Song stop to bless children and give them candies or tie a string around their wrist. Older people also tend to receive plenty of blessings. 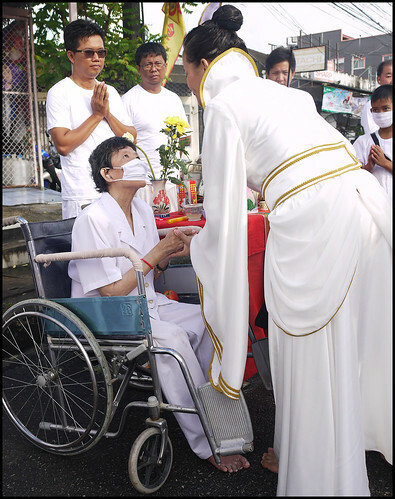 (above) Blessings along the procession route. (above) Oh yes and some pierced tongues too. This piercing certainly divides opinion. Some people (like me) find the festival fascinating. Some people can't grasp the idea that another culture exists with old traditions that don't match their own ideas. Three cheers for diversity. I walked with the procession down a couple of streets that I'd never really walked before and then into the center of town. It was not a wet morning, and the sun was up. I was hot and thirsty by 8am. 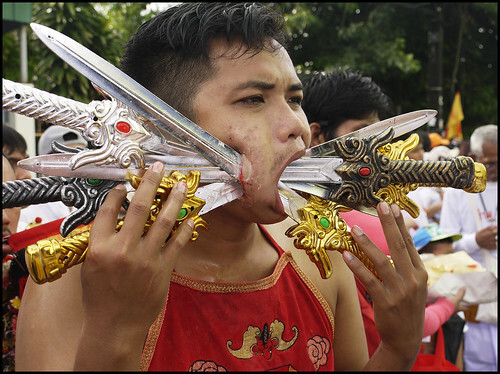 Imagine doing this long walk with swords in your face or carrying a heavy statue! 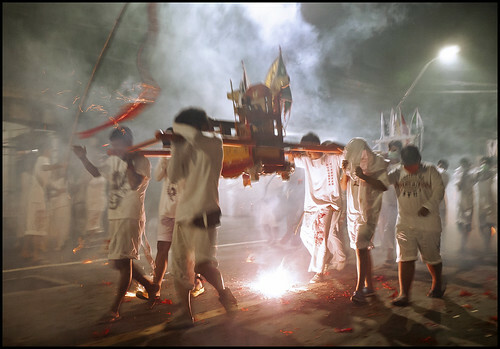 And now for a small video all about firecrackers ... A couple of Ma Song at the front of the procession, and then some of the action with the gods being carried through the streets. The firecracker action at the rear of the processions has become my favourite part! I like to get close and get covered in debris. The noise and smoke can be pretty intense. I would have stayed longer, but my camera battery ran out. I had a spare .. in the car, which was parked a couple of kilometers away. And the phone was giving me a low battery warning too. Shame .. I was just starting to get into the spirit again! Will make more of an effort next year. Hopefully with a new camera. These photos are taken with an old Panasonic Lumix G1 which has seen better days. The focus is a bit dodgy and it has a maximum aperture of only f/3.5 which is not ideal for portraits. Anyway, I was glad to have made the effort on this last morning. One more picture ... Sui Boon Tong shrine seems to have an axe fetish. A group of 9 Ma Song (1 for each of the emperor gods?) were all walking together slicing themselves. Sorry about the blood! 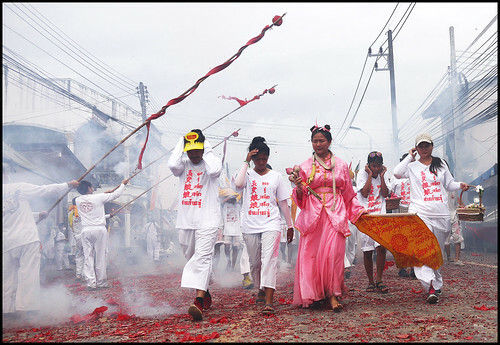 The Sui Boon Tong procession was on October 9th, the last of the morning processions. The big crazy final night procession through Phuket Town took place the same night, but due to a combination of rain and laziness I decided to skip it this year. The festival is based on the lunar calendar so the dates change every year. See you there!